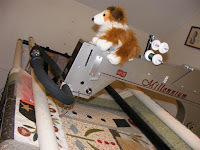 Quilting Adventures: Time is relative...... Thanks Einstein! Time is relative...... Thanks Einstein! How easy it is to get caught up in time. The next thing you know it's been a couple of weeks since you last blogged! sigh! Did you ever have that feeling that someone is trying to tell you something? Yea, the Spring Fling quilt is still on Penelope and has been for quite some time! I guess it's time to take her for a ride and get that top finished once and for all! A long arm is something I would love to have, then maybe I would finish my large quilts. I just hate to pin and try to work on a large one with free motion, but need to learn. Clubs, clubs and more clubs... Sew much fun...!